delicious wife: strong girls wear weightlifting belts! strong girls wear weightlifting belts! i used to think weightlifting belts were dumb. i thought guys wore them just to look cool and feel tough. back then, i was squatting 55 lbs. obviously, i was not an authority. over time, my form improved, and i started going up in lifting weight. LT, my husband and trainer, said i should try his belt. he said it would help. what...is the belt gonna lift the weight for me? ughhh, i didn't want to wear that bulky, ugly belt. as if i need a belt! i finally was able to squat 120lbs. i was thrilled, and couldn't wait to to go up 2, 5, 10, or even 20 pounds. but, i stalled...for weeks at 120lbs. which was good, but i wanted to go up! so, LT offered up his belt, again. and, even though i like to act like i know what i'm doing, and i don't like taking anyone's advice...i smiled and said yes. i must admit, when i was putting the belt on, i thought, this is such a waste of time. i turned around, got into position, and squatted...the same ol' 120lbs. that belt was magical! squatting 120lbs was easy peasy. i added 15 pounds to the bar...ambitious, i know. with teeny bit of doubt and a ton of confidence, i squatted 135lbs! i did it! 135 freakin' pounds! why the heck haven't i been wearing a belt this whole time? in an instant, i was stronger. my form was better. and, my stomach and spine felt supported. so, i asked LT, how the belt works? and in LT fashion, he said, "i'll email you an article. you should read it." here it is, from 70s Big, no less! and YOU should read it, too. who should wear a weightlifting belt? weightlifting belts are not just for Olympic power lifters! Justin, from 70s Big, says it best, "If your goal is to get stronger (and you have been lifting longer than two months) and you refuse to wear a belt, you are a [freaking] idiot." he used the f-word. he's cool like that. but, i'm running a family show here, so, you know...editing. basically, if you're power lifting, dead lifting and/or squatting weight that takes moderate effort, you should wear a belt. why you should wear a weightlifting belt? how do you use the belt? that 70s Big article, above, does a fantastic job of explaining...read it, seriously. the belt should be right on top of your abs, hitting under your ribs and just below your belly button. a weight lifting study showed weight belts work best when you inhale and hold before each lift. inhaling expands your midsection and allows you to push your abs into the belt. this creates abdominal pressure and reduces spine load. the belt you use should be the same width all the way around. if you've got a shorter torso, use a 3". if you've got a longer torso, use a 4". it's that simple! oh, and you can get a traditional belt buckle or velcro belt. i personally love Best Belts. their belts are made from a strip of heavy leather. Dean and his son run this shop, and they do a fabulous job. they make the belts from start to finish. and even pay extra attention softening the leather for added comfort. they're still stiff enough to do the job, but easier to fasten and don't cut in the skin. they'll also custom make for special measurements. and, i can't say enough about the customer service...awesome! and girls, they come in all colors! 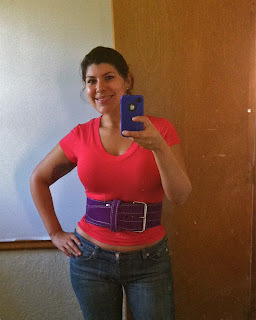 i've got a 4" wide single buckle suede belt in purple. turns out i was right! when i wear my weight belt, i totally look cool and feel tough. best of all, i'm strong, too!